The Automatic Liquid Packaging Machine for liquids is a quality offering that makes use of highly accurate IC controls to fill the pouches with right amount of liquid contents. We also offer customization on the machines for a variety of packaging unit sizes. Our packets come composed from quality material so that they survive the harshest of transport conditions and come in a good number of sheath thickness that provides strength. 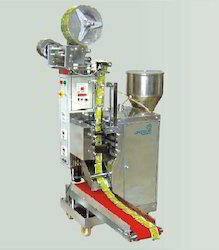 UNIQUE PACKAGING SYSTEMS supply Automatic Liquid Fill & Seal Machine for Liquids, Paste, Ketchup, Wine, Shampoo, Milk, Water. These are meant for packaging Liquids, Paste, Jam, Tomato Ketchup, Wine, Shampoo, Soya Milk and Mineral Water etc.Special Features of Automatic Liquid Fill & Seal Machines:Sealing Type: 3 Side / 4 Side / Center Sealing.